Focusing your camera at the hyperfocal distance ensures maximum sharpness from half this distance all the way to infinity. The hyperfocal distance is particularly useful in landscape photography, and will help you make the most of your the depth of field — thereby producing a more detailed final print. However, knowing the hyperfocal distance for a given focal length and aperture can be tricky; this tutorial explains how it is calculated, clears up common misconceptions, and provides a hyperfocal chart calculator. Note how only the right image has legible words throughout, since it uses a focusing distance between the nearest and furthest parts in the scene. Similarly, focusing at the hyperfocal distance often achieves the best balance of sharpness from foreground to background. Where is this optimal focusing distance? 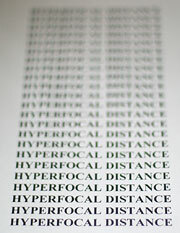 The hyperfocal distance is defined as the focus distance which places the furthest edge of a depth of field at infinity. If one were to focus any closer than this — if even by the slightest amount — then a distant background will appear unacceptably soft. Alternatively, if one were to focus any farther than this, then the most distant portion of the depth of field would be wasted. You can calculate hyperfocal distances using a different definition for "acceptably sharp" by using the "show advanced" feature. Just modify the eyesight, viewing distance and print size parameters from their default settings. However, keep in mind that this will require a much higher f-stop, or focusing farther away than otherwise. What if your scene does not extend all the way to the horizon, or excludes the near foreground? Although the hyperfocal distance no longer applies, any scene still has an optimal, intermediate focusing distance. Many use a rule of thumb which states that you should focus roughly 1/3 of the way into your scene in order to achieve maximum sharpness throughout. While this is sometimes helpful, it is rarely optimal; the precise distance actually depends on many factors, including subject distance, aperture and focal length. To calculate optimal focus precisely, use the depth of field calculator, and ensure that both the nearest and furthest distances of acceptable sharpness enclose your scene. The fraction of the depth of field which is in front of the focal plane approaches 1/2 for the closest focus distances, and decreases all the way to zero by the time the focus distance reaches the hyperfocal distance. The "1/3 rule of thumb" is correct at just one distance in between these two, but nowhere else. 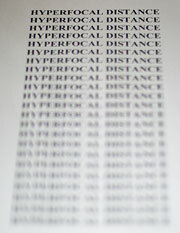 Focusing at infinity causes the nearest acceptably sharp objects to correspond with the hyperfocal distance. The problem with the hyperfocal distance is that a distant background is on the furthest edge of the depth of field, and is thus barely "acceptably sharp." This may therefore lead to an undesirable loss of detail with images comprised primarily of distant objects (such as many landscapes). Blind adherence to the hyperfocal distance often also neglects regions of a photo where sharpness is critical. 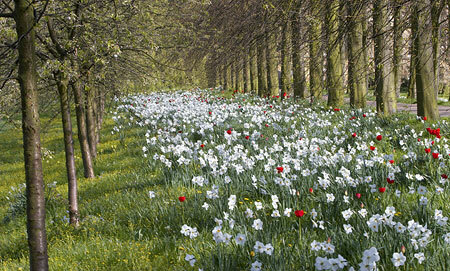 For example, a finely detailed foreground may demand more sharpness than a hazy background (left). 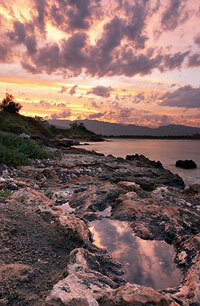 Alternatively, a naturally soft foreground can often afford to sacrifice some sharpness for the background. Finally, some images work best with a very shallow depth of field (such as portraits), since this can separate foreground objects from an otherwise busy background. 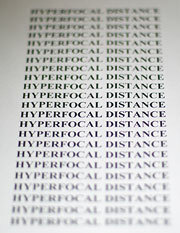 The hyperfocal distance may not be appropriate for photos demanding quick judgement or with a limited depth of field. For example, sharpness with hand-held street photography is often less important than getting the shot. On the other hand, if one has sufficient available light, manually setting a lens to the hyperfocal distance can avoid focusing errors, reduce shutter button delays, and make photography a virtually "point and shoot" process. The hyperfocal distance is best implemented when the subject matter extends far into the distance, and if no particular region requires more sharpness than others. Even so, it's often helpful to use a more rigorous requirement for "acceptably sharp," or to focus slightly farther and improve background sharpness. Also try manual focus using the distance markers on your lens, or using the distance listed on the LCD screen of your compact digital camera (if present). Finally, use as near a hyperfocal distance as necessary, but no nearer. Using too high an f-stop can be counterproductive since this can soften an image due to an effect called "diffraction," which is irrespective of the depth of field.